Passing through the long hallway leading to the main central area, you will find the Family Area, Parent's Room, Nanny Room and the Games Room located on your left and the Spa, Quiet Room and Prayer Room located on your right side. The family area has its own little buffet area offering drinks, desserts and baby food. One gets own key to the quiet room. Cool! Shower room with Rituals shampoo and conditioner (Organic argan oil & Eucalyptus) and bath and shower gel (Sweet orange and cedar). As of August 2016, a guest can use one of the quiet rooms for a maximum of 6 hours. Last week, I was fortunate enough to visit the newly opened Al Safwa Lounge which is Qatar Airways exclusive lounge for its first class passengers. I've seen a lot of pictures of this lounge prior to my visit so I knew more or less what to expect. Those who have previously visited this lounge thought that it was stunning and huge, and I totally agree with them. I've been to Lufthansa's First Class Terminal in Frankfurt more than a year ago and to Cathay Pacific's The Pier First Class Lounge in Hongkong in July and I have to say that Al Safwa is my favorite. Nevertheless, there are still things which I think this lounge can improve on. First, I thought that as much as the food I had during lunch and dinner tasted very good, I think that they should have better choice: like the ones being offered by Emirates in their First Class Lounges in Dubai or the ones being offered at The Pier First Class Lounge in Hongkong, which is presently being catered by The Peninsula. Second, I really think that they should offer free massage or something in the SPA as Emirates, Etihad and Thai Airways do offer complimentary massages in their lounges even for just 15 minutes. I was able to have a tour of the SPA although I did not have any treatment. Jessica, the SPA receptionist told me that the reason why they are not giving complimentary treatment is that because it is not owned by Qatar Airways. She said the SPA is owned by the same owner of the Airport Hotel and the SPA located inside the Hamad International Airport (which I thought have really expensive rooms). 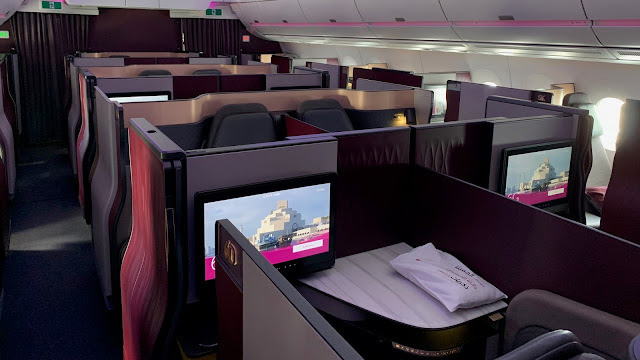 I wish Qatar Airways had opted to make a spa which they can call their own and which could have been available for their first class passengers free of charge since the treatments in the SPA really costs a lot. Also, the sign "Lift to the departures" was sort of confusing as I thought it was the way to another exit, but as I later found out, it is only being used by passengers taking the aircraft in a remote stand. Lastly, although there are individual shower rooms inside the quiet rooms, the only other shower room is located inside the family area and which I thought was not enough. They have a lot of shower rooms in Al Mourjan Lounge so why not do the same here in Al Safwa? Of course, there are a lots of things I loved about this lounge, the most obvious is its stunning architecture which reminded me of the design of the Museum of Islamic Art. Then, there's the family room, and the business center which is more or less like the ones they have in Al Mourjan although here it is more private, although my favorite was no doubt the quiet room. This is actually the first time I have visited a first class lounge where you get a real bed, a TV and a shower room all for yourself! I love the Cabanas of Cathay Pacific as well as the slumber room of Thai Airways but the quiet room here is simply unbeatable. One has to remember though that you can not prebook a room so I suggest boking as soon as you arrive in the lounge in case you need one. There is also a smoking room, media room and prayer room which I thought were nice features as well. And because the lounge is exclusive to Qatar Airways first class passengers, I don't think this lounge will ever get crowded as they only have London, Paris and Bangkok routes with first class as well as their regional flights. Needless to say, this lounge is pretty much overstaffed which is a good and a not so good thing in itself. I was really happy I was able to visit the Al Safwa Lounge last week and even though it is not perfect, it is actually my favorite as this is probably the most beautiful first class lounge I have been to.